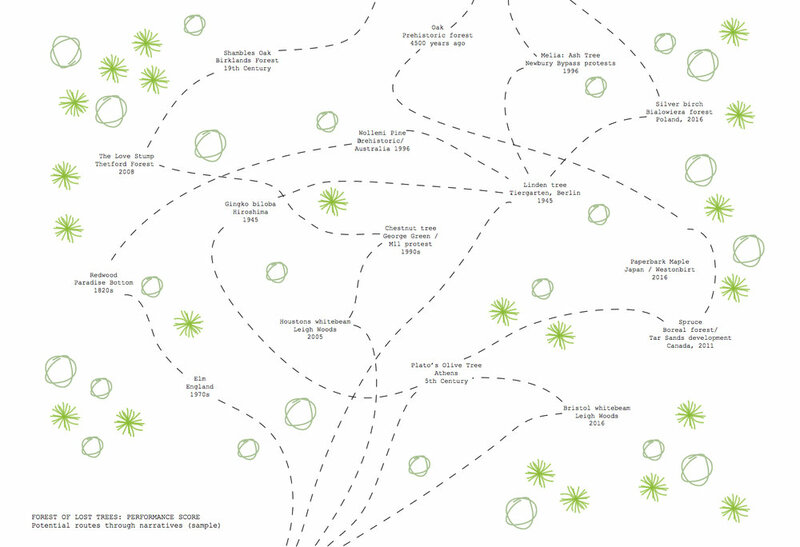 ‘The Forest of Lost Trees’, is a proposed performance. A performance in which stories are told in a forest. Lots of stories, true stories, stories that other people have told me, that I have dug up from history, that I have elaborated from archive, that I’ve intuited from a tree stump. Stories that are remembered and spoken aloud. As I make the performance, I will be writing. But in writing, I am thinking about speaking – whose turn of phrase is this? What is it like to remember these words? Are the words important or will the story be told a different way each time, the teller telling in their own way? I meet Nikki Morgans, the Recreation & Community Ranger at Leigh Woods in the late afternoon. This woodland, just outside Bristol, was gifted to the National Trust in 1908 by George Wills, a tobacco magnate. The Forestry Commission bought an adjoining section of land in the 1940s, at the time described as ‘devastated woodland’ having been largely felled during World War II – this has since been restored and is now a beautiful forest with SSSI status. I was drawn to this site because it’s got some unique and threatened species in it – several whitebeams that are endemic to the Avon Gorge, including the Bristol, Wilmott’s, and Houston’s whitebeams. It also includes an area named Paradise Bottom – a remnant of the Leigh Court garden designed by the famous landscape gardener Humphry Repton for Philip John Miles in the 1810s. Miles made a fortune from investing in ship building at the height of the slave trade. Paradise Bottom was a picturesque pleasure garden created to impress guests and lead to a vista of the river Avon. Another example of colonial exploitation and grand design in a landscape admired today. Westonbirt Arboretum is an international visitor attraction and you can see why. This beautiful and extensive arboretum includes an incredible collection of trees, building upon the original plantings of Robert Holford, a wealthy Victorian. Holford was part of the mid 19th-century boom in plant imports – as gardeners and botanists raced to find, grow and display exotic plants. Influential nurseries and collectors such as Holford sent Plant Hunters out to remote parts of the world – the booty of which is still evident in the arboretum today. The layering of histories in the landscape interests me. My project explores loss and memory – in relation to specific trees but also the wider landscape. Doreen Massey, reflecting on a woodland, writes of ‘places as meeting places; of people, of histories, of the flows and movements of myriad nonhuman things. In that sense places do not come fully formed … rather they are intersections, and as such must be negotiated.’ (Kings Wood: A Context). Birklands is an amazing example of this meeting of human history, natural history and a place formed through ongoing negotiation. Last week I visited forests in the Sherwood area looking at Forestry Commission sites as part of initial research for my Jerwood Open Forest project. My starting point is a search for ‘lost’ trees, but the forests are full of tangential paths.. they lead to stories eventually but by a circuitous route.